The term ‘light eruption’ is easy to understand – a rash that comes up after exposure to light. ‘Polymorphic’ is more difficult. ‘Poly’ means ‘many’, and ‘morphic’ means ‘forms’. 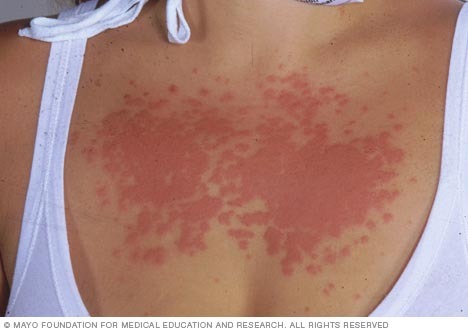 In other words, the rash of PLE can take many different forms, including small red bumps, larger red areas, and blisters. In PLE, a rash with one or more of these components comes up a day or two after exposure to the sun. PLE is common, perhaps affecting up to 10% of the population. It tends to appear in the spring. PLE is a response to sunlight. As little as 20 minutes of strong sun can trigger it. PLE can come up even when the light has passed through window glass, and sometimes even after exposure to fluorescent lighting. Both long (UVA) and short (UVB) wavelengths of ultraviolet light can cause PLE in a susceptible person, but it is still not clear how they trigger the rash. An immunological reaction seems the most likely explanation. Most people with PLE get it in the spring after they go out in the sun. Often it comes up on a holiday abroad, and sometimes it clears up before they return home. The rash tends to affect areas that have been covered by clothing during the winter. It goes away without treatment in about a week if there is no further sun exposure. If you stay in the sun, the rash will get worse and spread; but as the summer wears on, the skin becomes resistant to sunlight and more of it is needed to provoke the rash. Women get PLE more often than men. It affects people with all types of skin but is most common in those who are fair. It is most common in countries where the climate is temperate, and exposure to the sun is usually not heavy. It is not infectious and has no connection with skin cancer. No treatment will get rid of PLE forever. However, many people remain clear if they avoid exposure to the sun and use an effective sunscreen. The tendency to get PLE may go away by itself after a few years. De-sensitisation of the skin is the most effective treatment. The regular use of sunbeds, starting early spring and prior to going on holiday can be the most effective way to prevent PLE occurring by building the resistance to sunlight.